In 2008 I was diagnosed with Avascular Necrisis. This disease interrupts blood flow to bone causing it to die. I have had my left hip replaced twice since then and have had complications and great difficulties after both surgeries. Simple things like walking have been hard and a sneeze or cough can cause me to buckle over in pain. Doctors had me taking 20 pills a day and I needed a cane most of the time to walk. Flying to locations to play shows have been brutal and I have had to limit my activites. In November 2012 I have had a breakthrough and no longer take pills or use a cane! I am now doing physical therapy and improving each day. Medicals have piled high and I am in the process of paying them off. Due to these bills I have been selling off my personal music collection but I am getting by and that is most important. To everyone concerned I say : Thank you and don’t worry about me, for I am not going anywhere and look forward to laying down the brutality! 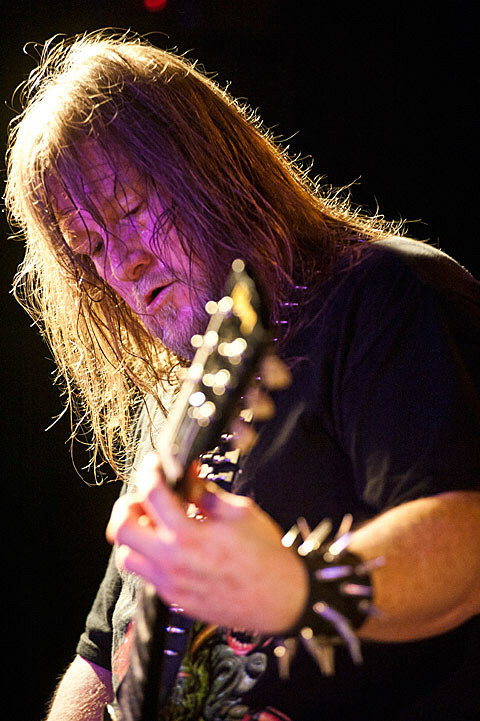 The great Eric Cutler of Autopsy has been auctioning off rare memorabilia at his eBay account to help cover some of those medical bills. Currently, all of his items have concluded bidding but surely more will surface. Bid hard to get a piece of death metal history and to help a worthy cause. Autopsy is currently working on a new LP, though no word as to when that may surface. Until then, you can get some older material via the band.